Brrrr! Bundle up! 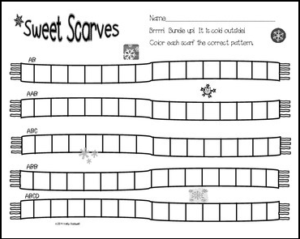 It is cold outside but this patterning freebie will warm your heart! Each scarf has a different pattern for children to color. Great as a quick patterning assessment, as a Math center, morning work, homework or for early finishers. So try and stay warm and enjoy this FREEBIE! Please check out my other products and follow my store, too. Thank you!